For the first time in many months, California has been experiencing weather conditions pretty close to the climatological norm for the time of year. After a summer of searing, record-breaking heat, the past few weeks have featured temperatures relatively close to typical early autumn values across much of the state (temperatures have actually been somewhat below average across interior portions of the state, particularly across the Sierra Nevada, where the season’s first dusting of snow fell last week). In a welcome reversal from the relentless inland heat this summer, conditions have been warmer than average only along the immediate coastline–not an unusual fall set-up in California. Generalized statewide warming will occur over the next few days, and some late-season heat will occur over near-coastal portions of central and southern California this weekend as offshore flow develops. In fact, gusty hilltop winds and very low humidity will lead to fire weather concerns this weekend in the Bay Area and Southern California coastal hills. But a gradual cool-down back toward typical values is expected once again later next week, and perhaps even a bit below average after that. These relatively mild temperature swings–with occasionally breezy conditions–are the product of “inside slider” type low pressure systems dropping southward over the Great Basin. 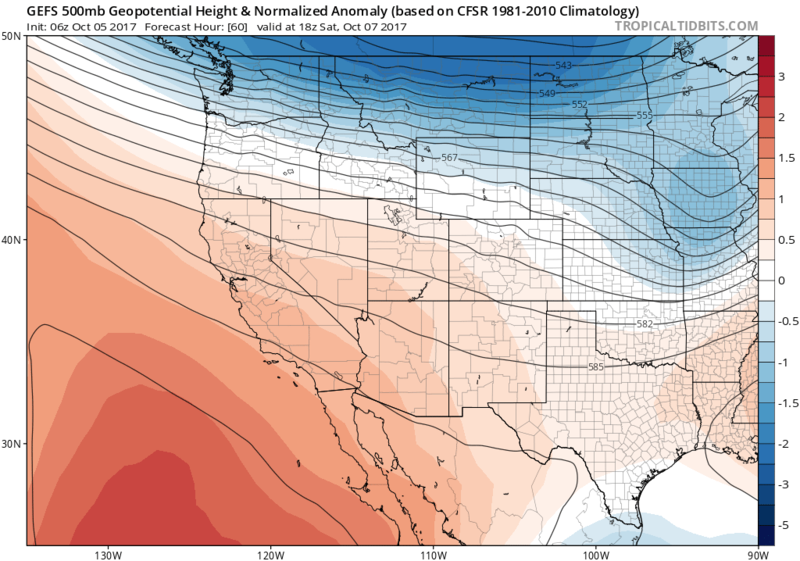 These systems are unlikely to bring any significant precipitation to California over the next 1-2 weeks, and conditions look dry for the foreseeable future across most of the state. 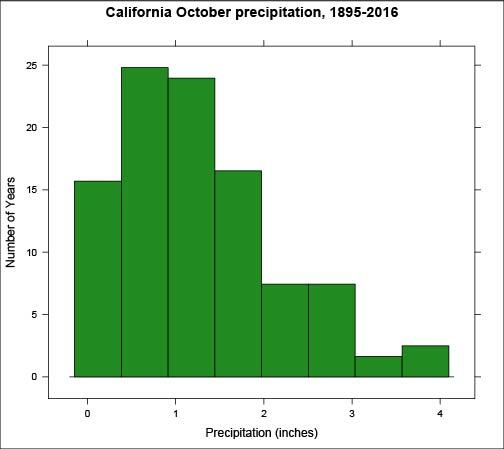 What’s up with October precipitation in California? There’s often much consternation on the part of California weather watchers when dry conditions persist during the month of October. It’s certainly true that October is often the transition month between California’s long, dry summers and (usually) wet winters, and almost always brings cooler nights, milder days, and a general sense that winter is coming. However, autumn in California is also characterized by dramatic year-to-year swings that ultimately have little bearing on conditions during the rainy season that follows. (A quick analysis using data from NOAA confirms that the correlation between October and December-February statewide precipitation is a minuscule, and not statistically meaningful, 0.09). Why, then, is there so much excitement over what happens during the month of October? My best guess is that our collective perception of what constitutes a “typical October” is strongly shaped by a quirk of California climatology. The historical precipitation distribution during this month exhibits a strong “rightward skew”–in other words, there are many more dry Octobers than wet ones overall, but when October is wet, it can be quite wet indeed. The more general statement that there are “more dry years than wet years” holds true across California, but this effect seems to be particularly pronounced in early autumn. The reason? 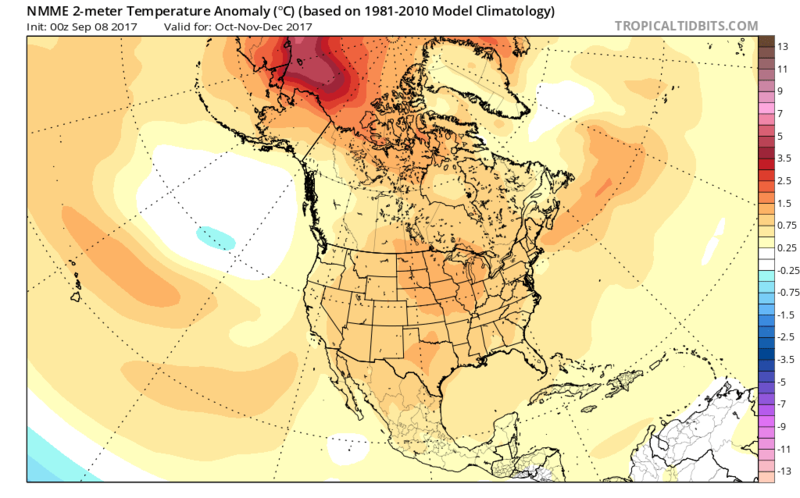 October tends to be dominated by essentially “summer-like” high pressure during most years, with relatively modest precipitation outside of the northernmost part of the state. Every 5-10 years, however, October can become very wet month indeed–and some notably powerful early-season storms have affected Northern California in recent years. Anecdotally, there does seem to be a link between “recurving” West Pacific super typhoons and California’s occasional very wet Octobers, but that’s a discussion for another day. La Niña now developing in Pacific; what can we say about upcoming winter? A substantial La Niña event now appears to be developing in the tropical Pacific Ocean. There were hints of this in the coupled ocean-atmosphere models this summer, though the magnitude appears to have been underestimated. 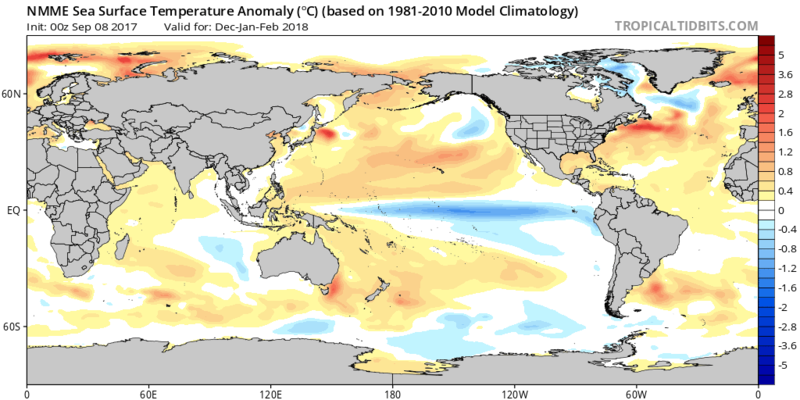 In any case, there is now a general consensus that the now-established cool ocean temperatures in the eastern tropical Pacific will persist through most of the upcoming winter. Concurrently warm temperatures in the far western Pacific (and a much broader area of anomalous warmth in the subtropical North Pacific) have the potential to reinforce a fairly classic “La Niña-like” atmospheric response this winter by further strengthening the west-east tropical temperature differential. What does all of this mean for California? Well, that’s a bit of a loaded question in the wake of two very conspicuous seasonal forecast failures over the past two winters in California. The very powerful El Niño event in 2015-2016 yielded a dry winter in southern California, and the ENSO-neutral winter just last year was one of the wettest on record across northern portions of the state. Both of these outcomes were contrary to expectations, and there has recently been a surge in scientific inquiry regarding why this might have happened. While the jury is still out (and analyses are still underway–peer reviewed science tends to proceed slowly relative to shifting weather patterns! ), leading contenders are 1) the unusually broad pattern of ocean warming in recent winters and 2) just plain old “bad luck.” In other words: it is possible that the atmospheric response to ocean temperature variations caused by El Niño/La Niña is now different than it would have been if the subtropical Pacific hadn’t been so warm in recent years. But scientists have also known for a long time that ENSO, despite being the single strongest indicator regarding California precipitation on the seasonal scale, is far from the only game in town. It may well be that other influences were simply more important in recent years, essentially drowning out the ENSO influence. Nevertheless, there is still very strong theoretical and observational evidence that El Niño and La Niña do indeed exert a substantial and somewhat predictable influence upon California winter precipitation. In practice, this influence is large enough to influence seasonal forecasts only during moderate to strong El Niño/La Niña events, and that influence is strongest 1) in Southern California and 2) during the second half of winter (especially late January, February, and March). So what about this year? Well, it looks like La Niña may indeed reach at least moderate strength over the next couple of months and will have a rather “classic” presentation across the tropical Pacific, suggesting that there may be an elevated risk of drier than average conditions during the second half of winter, particularly across Southern California. This is a conclusion supported by current seasonal model forecasts, but only weakly. Temperature wise, there is near unanimity that the autumn will be quite warm on average across California (apparently a product of very warm ocean temperatures over the subtropical Pacific Ocean). 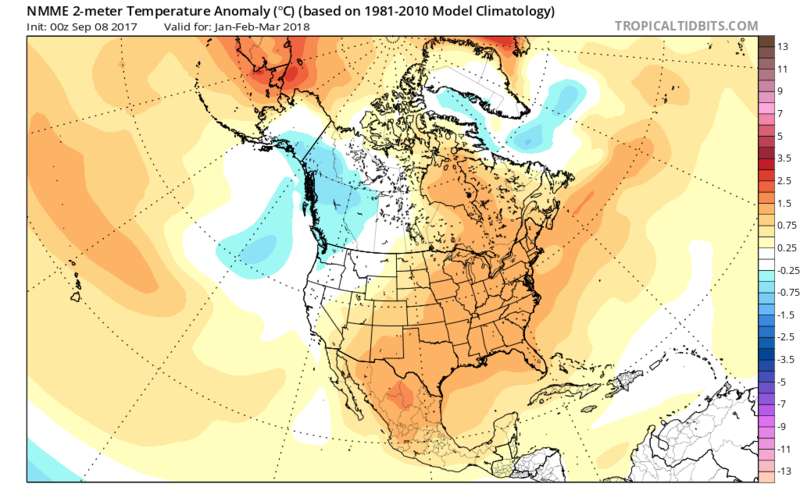 Later in the winter, however, there is also agreement regarding a trend toward a more La Niña-like temperature pattern–with below average temperatures across the Pacific Northwest possibly extending into California. (Interestingly, seasonal temperature forecasts tend to do much better than precipitation forecasts in the presence of a significant La Niña event. The presence of persistent North Pacific high pressure is the classic atmospheric response to La Niña, which reliably allows cold air to spill southward from Alaska/Canada but only sometimes blocks the Pacific storm track sufficiently to prevent rain to California). 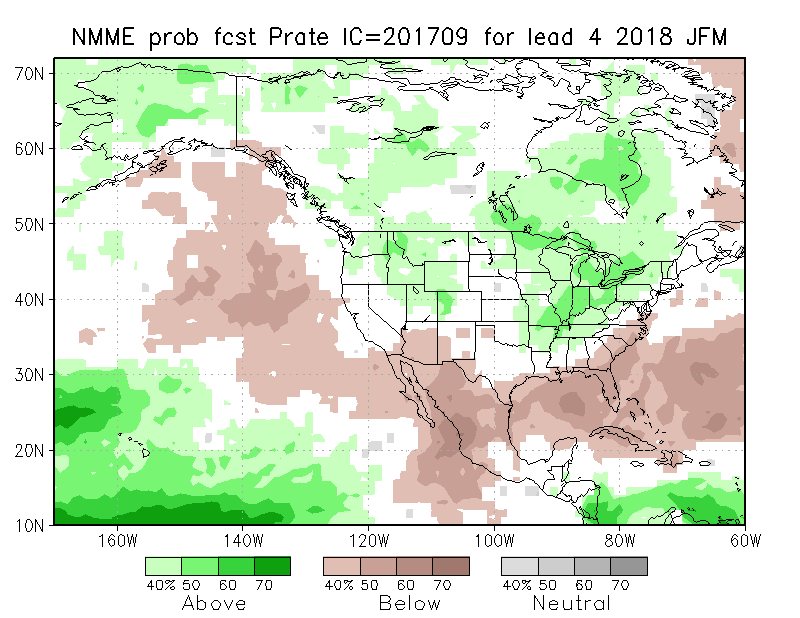 So, to sum it all up: a moderately strong La Niña event this winter will tilt the odds slightly in favor of a dry second half of winter, especially in the south. Autumn temperatures will likely be above average, but winter temperatures may trend back toward or below average. I’ll be having a free-form conversation on climate change (with a California focus) with Sarah Feakins and Michael Mann tonight at the Los Angeles Museum of Natural History. The (free) tickets for this event sold out weeks ago, but there will be some limited availability for those who show up at the door. If you are interested but can’t attend (or make it in the door), the event will also be livestreamed via the web on the UCLA Institute of the Environment and Sustainability’s Facebook page starting at 7pm.